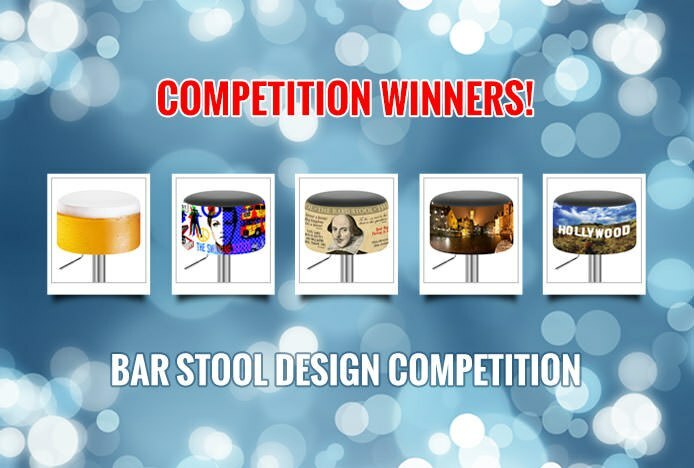 After three exciting weeks and a huge variety of entries, the votes for our Bar Stool Design Competition have now been counted, and the winning order of the Top Five has finally been decided. We are delighted to announce that the winner of the £250 top voucher prize is... Entry E: Beer! Congratulations to the winning entrant, the Beer design is an amazing idea that would catch the eye in any bar area. Well done to each and every one of the winners, the designs were brilliant and you are all very deserving of the voucher prizes! Each of the winners will receive an email in the next 24 hours explaining how to redeem their prize. We also wanted to say a big thank you to everyone who sent us an entry or simply voted in the competition. It was great to see your creative ideas and such a buzz being generated around the designs, as well as our printed Status Bar Stools. Make sure you keep checking back on here as well as our Facebook and Twitter pages for even more competitions and brand new product offers! "Simple, cool and what a bar stool is for, isn't it?" "I've created a Swinging Sixties design because everyone loves retro, and the Sixties is the decade when Britain led the world in art, music and fashion." "I thought it might be nice to feature William Shakespeare (the Bard of Avon) together with some famous quotes from his plays. I've called my design THE BARD STOOL!" "I travelled to Bruges just a couple of days before Christmas with thick snow crunching underfoot and frozen canals. This one holds a special place in my heart." "It is instantly recognizable and perfect for a themed diner or bar."